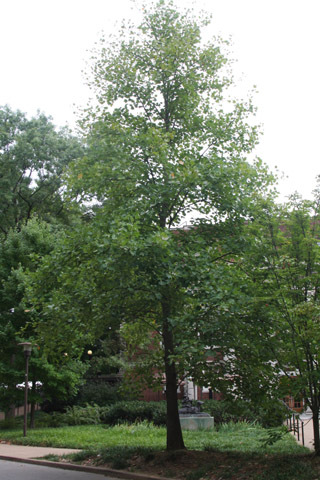 This tree is between Magnolia Circle and the Peabody Library. There are a number of large tuliptrees in the arboretum whose lowest branches are high off the ground. This small tree presents an opportunity to take a closer look at the leaves and twig. Close examination of the twigs shows that the leaf scars go all the way around the twig. This is a trait of the magnolia family, of which tuliptree is a member. This is your best opportunity to use the restroom and get something to eat or drink in the Iris Cafe, which is open to the public. It is in the lower level of the library at the end of a sidewalk leading from this tree. This organism is a living specimen that is part of the  Vanderbilt University Arboretum  with the local identifier unnumbered2.